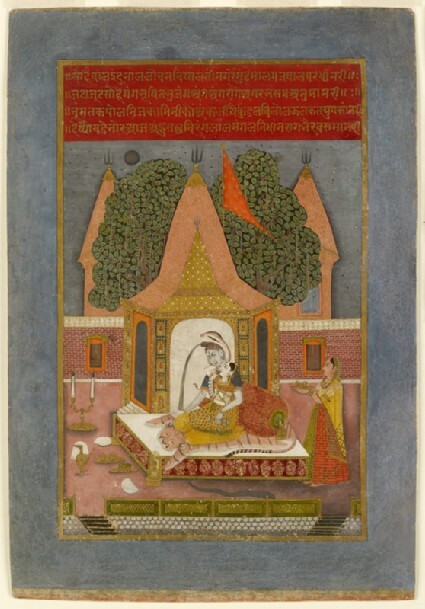 In this nocturnal scene the god Shiva and his consort Parvati are seen in the role of courtly lovers, embracing on a bed set on a moonlit courtyard terrace before a temple-like pavilion. Taking his wife on his lap, Shiva moves to kiss her cheek, as described in the Braj verses in his praise above. As befits Shiva the yogi and ascetic figure, his seat is a tiger-skin, symbolising the conquest of the animal passions. Wearing a cobra and with the river Ganges flowing from his hair, Shiva holds the hand-drum with which he beats out the rhythms of existence and time. In the last line of the verse there is a play on the words raga bhairava, meaning ‘the passion of Shiva’ or the musical mode Bhairava.